Note that some images have even larger versions that can be viewed by clicking on the large image displayed, but be aware that some of these are very large - i.e. census records, copies of ships' manifests (passenger lists), etc. Built by John Brown & Company, Clydebank, Scotland, 1914. 45,647 gross tons; 901 (bp) feet long; 97 feet wide. Steam turbine engines, quadruple screw. Service speed 23 knots. 3,230 passengers (618 first class, 614 second class, 1,998 third class). 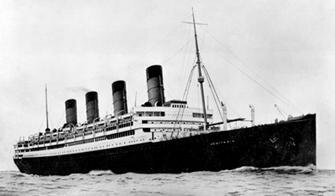 Built for Cunard Line, British flag, in 1914 and named Aquitania. Southampton-New York service. Served as auxiliary cruiser and then a troopship during WWI. Broken up in Scotland in 1950.